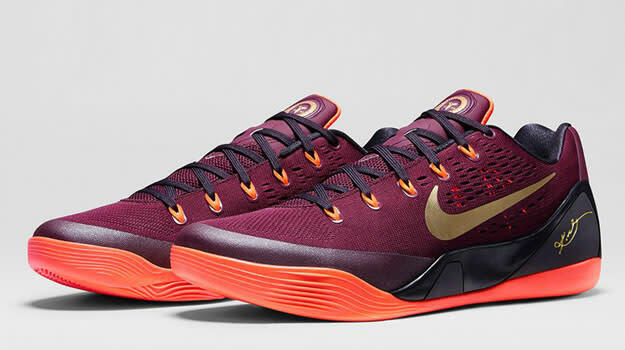 Peep the Official Images of the Nike Kobe 9 EM "Deep Garnet"
"Lower Merion?" "Fine Wine?" "Deep Garnet?" While many different names have been going around for this colorway inspired by Kobe Bryant&apos;s high school colors, we now have official confirmation from Nike that it is, indeed, called "Deep Garnet." Personally, we liked the other two names better, but what are you going to do? The "Deep Garnet" colorway pays homage to Mamba&apos;s Pennsylvania state title that he led Lower Merion High School to back in 1996. That year, which is the same year in which he was drafted No. 13 overall by the Charlotte Hornets, is emblazoned on the tongue of the shoe in a special logo not seen on other Kobe 9 releases. The rest of the sneaker is filled out with a deep garnet upper as black and hyper crimson cover the midsole and outsole. Get a look at the official images of the Nike Kobe 9 EM "Deep Garnet" in the gallery above and pick up a pair at Nike on December 13 for $160. RELATED: Could This Be the Nike Zoom Kobe Venomenon 5?